For years we have been organising our Advent concerts with an increasing number of visitors. 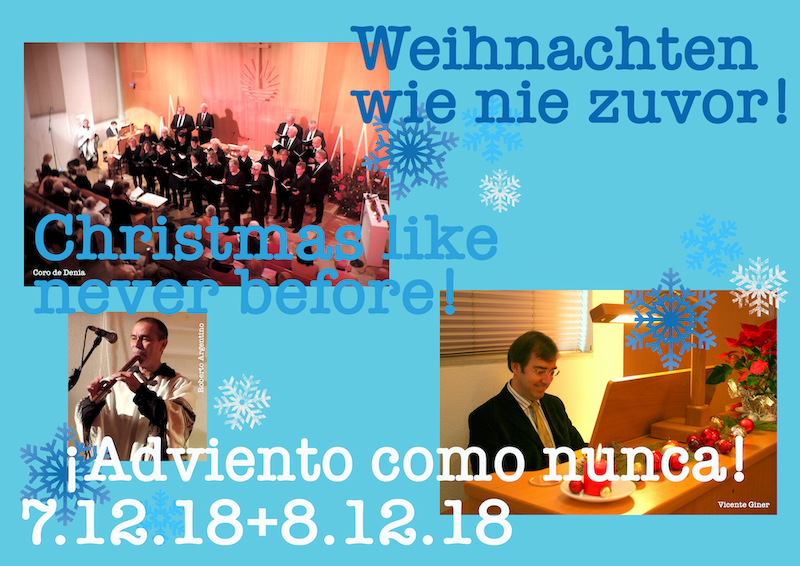 This year the concerts take place on Friday, 7.12.18, and Saturday, 8.12.18, each at 19.00 o'clock. The concerts begin with a classical part of Christmas music, followed by an international part with performances in different languages. The famous organist and organ teacher Vicente Giner, the well-known panpipe player Roberto Agentin, the HEARTBEAT Live-Duet and of course our mixed choir with soloists will be appearing. After the concerts there are bratwursts, mulled wine etc., just everything that belongs to the Christmas time. Admission is free but we are grateful for a donation to cover the costs.